Battle of Britain. Battle of Midway. Battle of the Bulge. I've heard of those. Haven't you? Despite all my reading about WWII and its various campaigns, I never heard of the Battle of Darwin. I stumbled upon it while researching where to write about for Traveling Tuesdays. I was curious as to whether Australian soil was involved in any of the WWII skirmishes. As it turns out, the continent of Australia was quite involved, primarily due to the its strategic location as a refueling station. 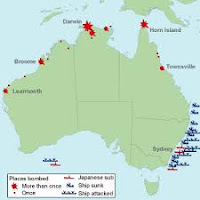 The country suffered nearly 100 air raids by the Japanese, and both Japanese and German submarines operated in Australian waters during most of the war. According to one report I found, a small Japanese reconnaissance party briefly landing in Western Australia during January 1944. 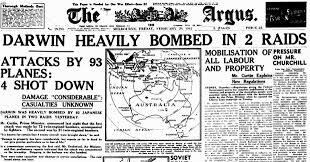 The Battle of Darwin occurred on February 19, 1942, and was the first and largest single attack made by a foreign power on Australia. 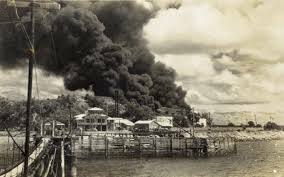 Damage to the airfields and the harbor impacted the ability of the military to support war efforts in Java and the Philippines. Twenty seven allied ships and thirty aircraft were destroyed, and several hundred people were injured or killed. The air raids caused considerable damage to essential services including water and electricity. 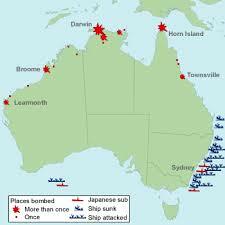 The attack at Darwin has often been compared to the one at Pearl Harbor. It was similar in that it was an aerial attack, and came as a great surprise. It was different in that Australia and Japan were at war, and the loss of life was not as heavy as at Pearl Harbor. Were you aware of this battle? Of Australia's part in the war? More on the brave citizens and Anzac soldiers to come.